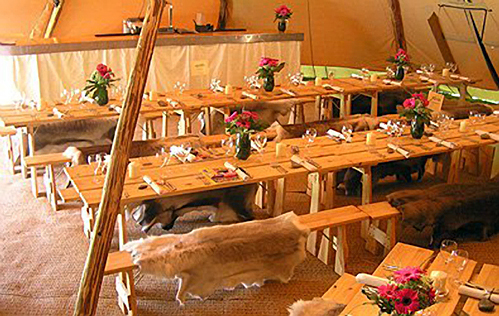 A winter wedding in a tipi with all the guests staying in rented farm houses for the weekend and a Great British bake off pudding competition to culminate was an occasion to remember. We kicked off with vintage afternoon tea of scones with clotted cream and English breakfast tea, with mulled wine for those that needed extra warmth and a sweetie counter to keep sugar levels up. A quick change into evening attire and guests reassembled for the ceremony followed by speeches and then supper of slow cooked pork with roasted winter vegetables, apple and rosemary jelly, cannelloni and haricots with fennel and baby spinach. Plenty of warm crusty pain de campagne , not a scrap was left on the plates . . . .
Prizes for pudding went to the best, the worst looking but tastiest and the one most likely to have come from Tesco. A guitarist started singing and marshmallows were toasted around the fire in the tipi, sadly we had to leave before the snow started . . . . The main 'theme' that India and Mark were hoping to keep running through the menu was using local ingredients from places that were important or close to their hearts. The locations they wanted to include were Norfolk (where India's family are from), Oxfordshire (where Mark's family are from), Winchester (where they live together) and Portsmouth (where they met, at university). So we decided on buttered Norfolk samphire as a starter, we served the samphire in large steaming bowls to each table with chunks of artisan bread for mopping up the wonderful juices. The main course was a choice of fish pie with watercress from Alresford, Winchester, or game pies with game caught in Oxfordshire. We also did lentil jalousie for vegetarians, all served in family style pie dishes to the table, with new potatoes and a selection of vegetables roasted to give sweetness. Pudding was a collective affair with family and friends upstaging us poor caterers with wonderful cakes and tarts. 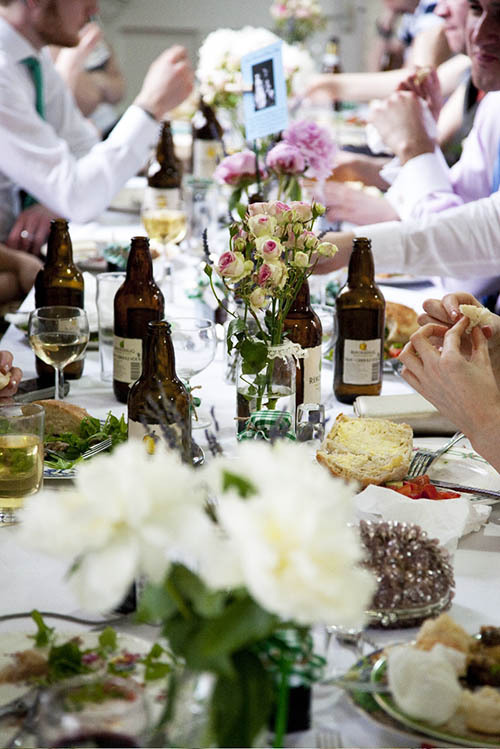 After toasts the guests meandered off to watch duck herding and to get some fresh air, when the storm clouds gathered they returned to late afternoon tea, scones and the wonderful feeling of being warm in a barn with heavy rain pelting at the roof. 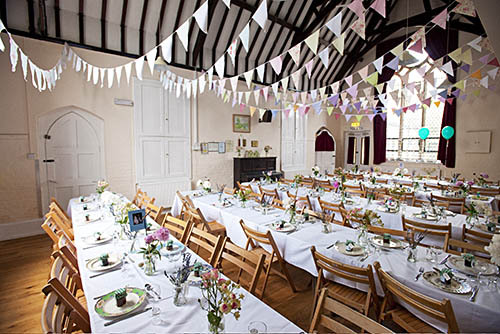 Laura and Ferdie wanted their wedding to have a varied and unusual menu. With traditional, Mediterranean and middle eastern dishes. We decided on very English canapés of salmon and rare roast beef before serving Spanish delicacies to get guests ready for some surprises. With the wood fired oven lit up and a small crowd, we began to roll out flat breads with za'atar to cook for the starters of babaganoush, hummus, tzakziki, roasted red pepper dip and harissa, all taken to the tables in colourful Moroccan safi dishes. 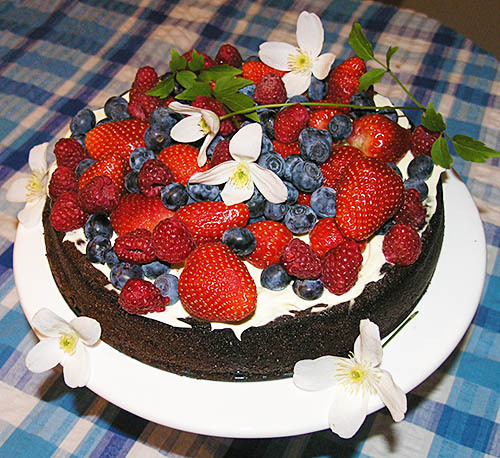 Pudding was fresh berries, honey and pinenut semi freddo and Laura's wonderful apple and cinnamon wedding cake . We had a wonderful cheeseboard - the size of a bath, full of local cheeses (not your stilton, cheddar and brie type of affair at all) membrillo, figs, walnuts and loads of crackers from Duchy et al. Dancing was so enthusiastic and boisterous there was not much need for the gentle warmth of the indoor fire. We left at midnight, looking back at the giant tipi that literally was bouncing in time to the music and a very happy bride and groom. Ben from Yeo Valley and Rachel whose parents own an organic farm in Oxfordshire wanted to incorporate both aspects in their wedding breakfast. We settled on canapés of raw beef fillet, straight from Rachel's cold room and hung for 28 days, cut up finely and served on sourdough with some dill and rocket and Lord was it delicious. We also had some cooked beef for those that may have been a bit wary, but the raw won hands down. We also served gravad'lax and pan con tomate with a large Serrano ham being carved in front of the marquee. The main course was butterflied lamb from Rachel's farm cooked in our wood oven alongside roasted carrots, beetroot and fennel and a giant paella pan of patatas bravas. Alongside this we served salsa verde and a redcurrant jelly, pain de campagne and Guernsey butter. Pudding was our Sophie Dahl cake with Yeo valley cream taken to the table in pots, just to make it clear! Maew who beckons from Thailand, took over the Thai street food and offered krathoongthong, som tum, and Thai rice cakes cooked on site and served by her amazingly competent team (well, they later taught us how to carry 10 plates at a time). 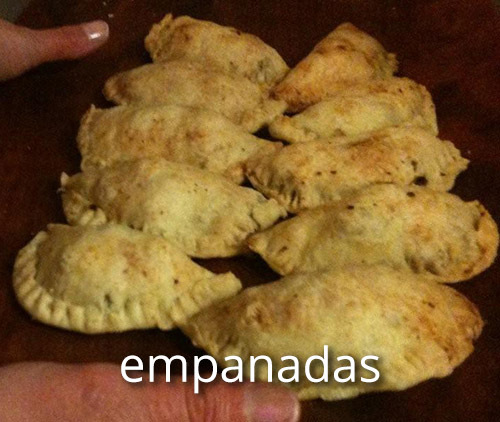 We also served Argentinean empanadas and malai koftas, an Indian street food. Main course was barbecued leg of lamb served with a salsa verde, ratatouille, our buttery milva new potatoes and a Yottam Ottelenghi recipe that Marnie (wedding in June) had introduced me to which is sublime al dente green beans, mange tout, peas, red onion and tarragon with a hint of chilli and lemon. Pudding could not be simpler - bowls of strawberries, raspberries and apricots with jugs of cream. 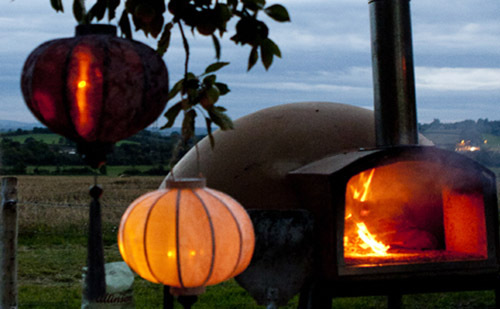 Later on we cast some logs into our wood fired pizza oven and baked late night pizzas under the faint light emanating from Chinese lanterns threaded on the trees in the orchard and the rising moon. 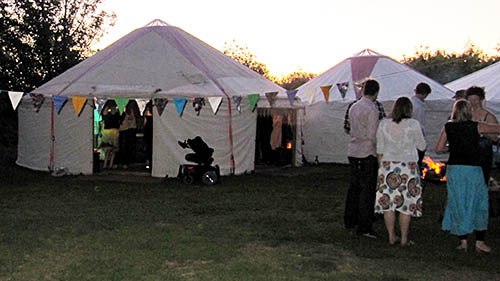 Music from an old gramophone greeted guests as they made their way into the marquee decorated with bird cages, antique rugs and vintage place settings. Our kitchen was a couple of tables under a very precarious blood-red ezy-up, which threw a surreal light onto every surface making you feel as though you were not quite in this world. Never mind we had a water supply, electricity for our oven and no rain. . The girls tottered around (cobbled paths) offering drinks and nibbles while guests chatted and had their photos taken. Our first course was a simple tapas starter as Marnie had spent much of her life in Spain. We served sourdough bread from Hobbs House, olive oil and balsamic vinegar, some Spanish omelette, chorizo and olives. Also some hummus for added dipping opportunities. For the main course we took chicken thighs that were stuffed with roasted garlic and sweet potato and served this with lemon cous cous, roasted aubergine with buttermilk and pomegranate on top -Yottam Ottelenghi recipe- as was the bean and nigella seed salad. We also had a tomato salad, mizuna salad, salsa verde and harissa to add some fire. All this was served on a buffet table with our vintage plates and cutlery. Puddings of chocolate brownies and giant eton mess were again served on the buffet table and later teas in our pretty vintage tea cups - very jolly. Emerging from the red ezy-up I had a head clearing cup of coffee out of sight of the guests, chatting to a nice looking man who had come out for a smoke, as he left the girls swarmed around, eager to educate me that he was only a hot actor from one of those twilighty types of films - I really feel old now. 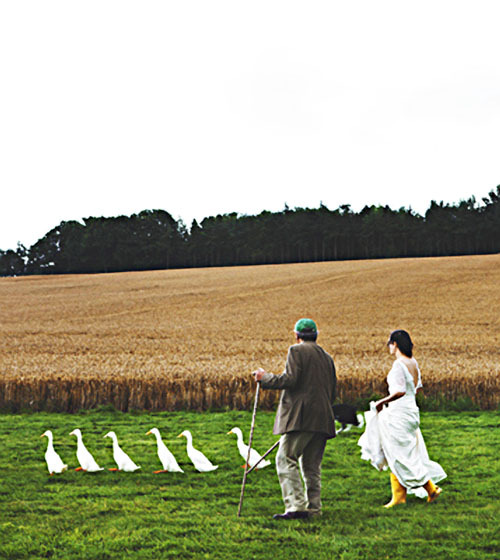 "They returned to the farm after the church ceremony was over. . . the fiddler led the way, his violin adorned with rosettes and streamers of ribbon. The wedding-feast had been laid in the cart-shed. On the table were four sirloins, six dishes of chicken, some stewed veal, three legs of mutton, and in the middle a nice roast suckling-pig flanked by four pork sausages with sorrel. Flasks of brandy stood at the corners. A rich foam had frothed out round the corks of the cider-bottles. Yellow custard stood in big dishes, with the initials of the newly wedded couple traced in arabesques of sugared almond. The meal went on until dusk, and towards the end some of the guests were asleep and snoring. " I love it! Obviously those aren't the specific dishes we want, but the overall sense of natural bounty is definitely what we are after! I'd be happy to hear your ideas about specific menus." 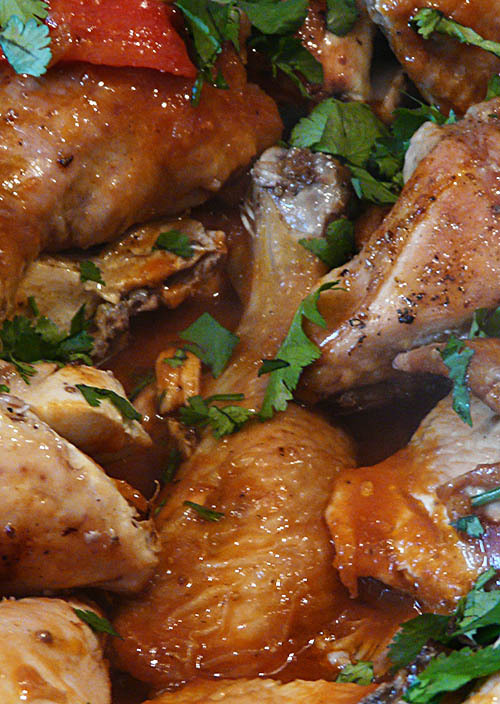 We roasted 8 whole organic chickens and served them on large wooden platters with roasted fennel and garlic. We also served large sirloins of beef with horseradish and caper sauce. We made rabbit terrines and also game pies and had large hams from Jesse Smith (one of Rick Steins food heroes) We chose salads that were in season, lots of colours and tastes, We also had huge wheels of Guernsey butter and shepherds loaves. Pudding we suggested could be a bit more English, large earthenware dishes of rice pudding with a modern twist of white chocolate and bruleed sugar spun over them. This was all presented on a buffet table with ivy garlands and vintage platters, the ones that may have slight cracks in but are so beautifully made. We left well after dusk, no guests were asleep and snoring, I had the rest of the night to finish the novel . . . . . .
Rowie and Ros took charge on the day, both of them experienced in open fire cooking and Spanish food. 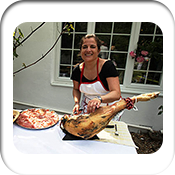 Begona also came to carve the Serrano ham. Rowie started on the pan con tomate which she made in front of guests, rubbing cloves of garlic on fire toasted ciabatta, then adding tomato (grown by her own newly scrubbed hands) salt and pepper and olive oil. 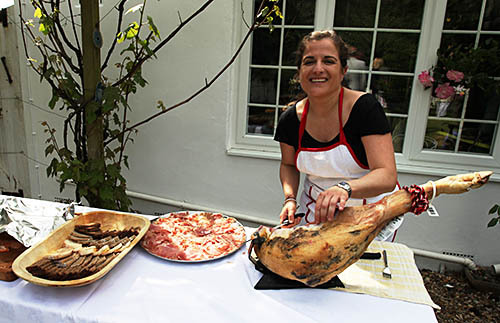 As Begona carved, guests helped themselves to the serrrano, either putting it on top of the pan con tomate or straight into their mouths. Ros carved the gravad'lax thinly onto Hobbs house organic rye bread, with a horseradish and caper cream. This was also passed around by the waitresses once the champagne rush had calmed down. We passed around albondigas with paprika and mint and served Spanish omelette made from our organic eggs and potatoes, they were in tapas dishes with little wooden sticks to pick them up with. 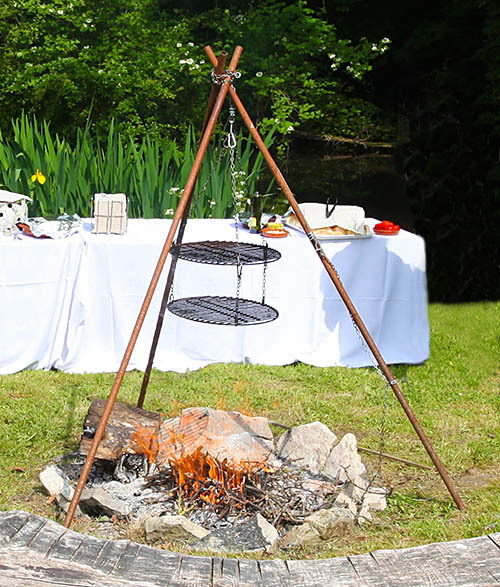 Later on in the day, and once the flames of the fire had died down a little, Rowie started on the organic mini burgers, putting them on the bottom tripod first to cook, then moving them up a bit to keep warm. As the guests asked for them so Ros prepared them, in little baps made especially for us by Thierry at La Parisienne, and adding some tomato, chilli, red onion, lime and coriander salsa and lettuce to make them extra juicy. We made special burgers for the vegetarians as well but they had to be cooked conventionally! A guitar player serenaded them, up came the stars and Rowie and Ros finally left to great applause from the crowd. We cooked chicken stuffed with butternut squash, roasted garlic and parsley and also served our famous porchetta which had been slowly cooking in our traditional hay box. We also had lots of vegetarians and quite a few vegans so we made sweet potato filo parcels which blended in well with the Spanish chickpea dish full of mild sweet paprika and red peppers for all. A salad of early baby tomatoes and red onion, coriander and lime with pink salt gave the zingyness and freshness that was needed and homemade harissa the heat, we also thought some apple and rosemary jelly would add some sweetness. Pudding was ice cream and berries, coffee followed and then singing and dancing and storytelling. The shadows were lengthening as we left but the evening sun was still blazing, the party cheered and we made our bows, well pleased! When I saw Sophie bake up this little beauty I could see straight away its potential on the wedding menu. 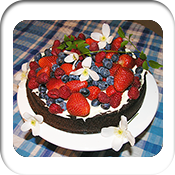 Not only is it full to the gunnels of dark and moist chocolate but it also has plenty of fresh fruit as well to keep everyone happy. We take a whole cake to each table with a vintage cake slicer. Adrian and Sarah Garrett had a brilliant idea of serving this to half the tables, and the other half caramelized apple tarts with Guernsey cream. If guests wanted both they simply had to get up and find a table that had the alternative on it. To complete the "trio" of desserts we served a bread and butter pudding from the buffet table for extra leg stretching. 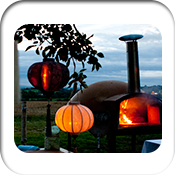 We had been recommended to Amy by Kate (whose wedding we had catered for at Purton House). Amy had already started to collect her vintage china and wanted to start her wedding breakfast with an afternoon tea to get full use of her tea set! The moment we saw the wedding party come out of the church opposite us we whisked the scones out of the oven, spread them with Guernsey butter and put on the homemade jam. They were placed on vintage cake stands next to pots of clotted cream and with big smiles the younger girls, dressed in pretty pinnys served pimms and elderflower cordials. The rest of us took to tea making and serving the afternoon tea side, helping to serve the scones and passing the chocolate brownies around. Meanwhile the potatoes were being rolled in olive oil and a wonderful sea salt that really brings out their sweetness. Whilst these were cooking the porchetta was resting. It had been stuffed with garlic, rosemary, fennel and a tiny hint of chilli. Amy specifically had asked for a salad of tomatoes, cucumbers, red peppers and red onions. We also did a rocket salad with a light dressing. Again Thierry provided us with the ciabatta rolls and we used Berkeley farm butter. Whilst Amy and Jon cut their wedding cake we finished drying the cups and saucers and out they came again, on trolleys to be served with the cake. "Talia and her team were fabulous on the day and during the planning process Talia was really helpful with any queries we had, she also totally understood the kind of wedding we were dreaming of which was a massive help." 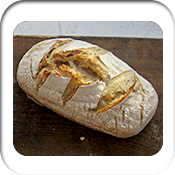 Not only is this amazing bread, boasting a sourdough starter that is over 50 years old, but it is a full 6 kilos. 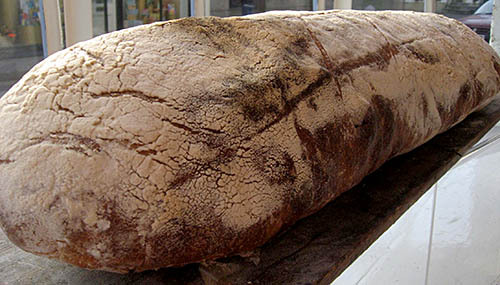 For the VIP's coming to the Fairford military show from all over the world we made a big feature of this wonderful loaf, with white gloved girls cutting it in front of the guests. Who would believe that the British still have fantastic bread! For a wedding we often have this Behemoth loaf later in the evening, with a big cheese table, homemade chutneys, figs and quince cheese. Or maybe with a big pan of paella in a more rustic outdoor setting and a hunk of bread with olive oil drizzled on it ~ the possibilities are endless . . . .